The Saudi-led coalition fighting in Yemen is obstructing deliveries of jet fuel to UN planes bringing desperately-needed humanitarian aid to the rebel-held capital Sanaa, a UN official said Tuesday. Auke Lootsma, the country director of the UN Development Program, also reported an outbreak of meningitis in Yemen, compounding the cholera epidemic and the risk of famine in the world's worst humanitarian crisis. 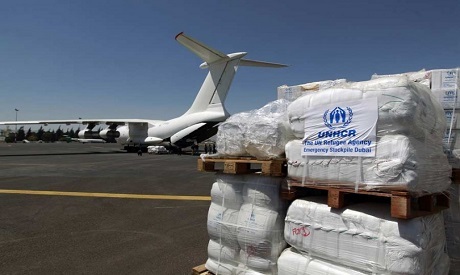 The United Nations operates two humanitarian flights into Sanaa from Amman and Djibouti, but there is no jet fuel available in the Yemeni capital for the plane to make the return trip. "We have difficulties obtaining permission from the coalition and from the government of Yemen to transport this jet fuel to Sanaa to facilitate these flights," Lootsma, the country director for the UN Development Program, told reporters by video-link from Sanaa. Asked why the jet fuel deliveries were blocked, Lootsma said: "It's a good question. I don't have an answer." The fuel must be delivered to Sanaa from the port of Aden, which is controlled by the Saudi-backed Yemeni government. The Saudi-led coalition has repeatedly been accused of blocking aid to Yemen, one of the Arab world's poorest countries, which has been brought to its knees since the military campaign began in March 2015. Yemen's health system has collapsed during the war pitting coalition forces backing the internationally recognized Yemeni government against Iran-backed Shia Houthi rebels. Describing the situation as "very bleak," the UN official said there were "several" new cases of meningitis detected in Yemen but he could not provide details. Aid efforts are also hampered by delays and refusals of visas, by the Yemeni government and by the rebels in control of Sanaa, he added. Lootsma said he saw "no end in sight" for the war that has left thousands dead, seven million people at risk of famine and more than 400,000 ill from cholera.